Saying that branding is important is like saying it is important to breath. Your brand is at the heart of your product and your company’s mission. Products live or die based on customer perceptions about your brand. Custom POP displays provide product manufacturers with a “moment of truth” opportunity to form an impression about your brand exactly when it matters most- when the customer is about to buy or thinking about buying your product. The biggest challenge for larger, more established brands is keeping the brand fresh and avoiding the backlash against big brands that has been enabled by social media. Smaller, less established brands have perhaps a greater challenge than the big brands in that they will never be able to outspend the big guys. In addition, they have to compete in a very noisy marketplace in which everyone is fighting for the attention of potential customers. The challenge for smaller brands just got tougher with Amazon’s recent acquisition of Whole Foods. Amazon is all about volume and product velocity. What that likely means is that Amazon will be looking to partner with bigger brands that can really move product. This will come at the expense of smaller brands who have been trying to claw their way into an opportunity to test their product in just one region of Whole Foods. As Amazon extends its platform further into physical retail stores (and it will), the challenges will mount for the less established brands. With that background, let’s focus on some of the important practical aspects of branding in retail environments. 1) Communicate Quality of Your Brand at the Point of Sale- If you are providing a custom POP display to a retailer, one thing you don’t want to cheap out on is the branding. Having a nice permanent POP display with a cheap cardstock header is definitely not the way to build a quality reputation for your brand. 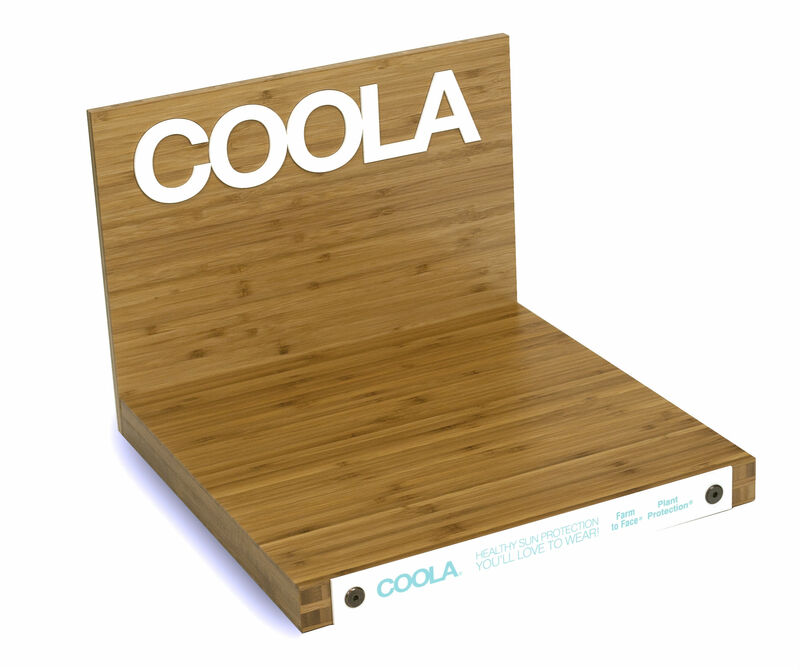 You can see from the example of the Coola display shown below that a consumer would likely conclude that Coola is a quality brand. The combination of natural solid bamboo and 3D acrylic laser-cut letters helps to create a premium brand image. 2. Include Permanent Branding- Whenever possible, be sure to include permanent branding on your custom POP displays. Many of our customers want the flexibility of interchangeable signs. Generally, we agree that is a great idea, but it is also a good idea to make sure there is some kind of permanent branding on your display. If you don’t have permanent branding, your POP display could be hijacked by the retailer or another brand, and your investment in the display will be history. 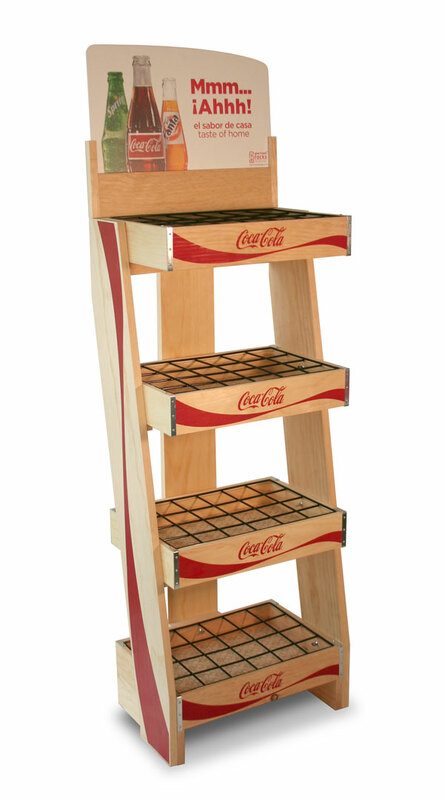 The Mexican Coke rack we made below is a good example of combining permanent branding on the sides and shelf fronts with an interchangeable header sign. 3. Secure Secondary Placement Opportunities- While it is critically important to brand your point-of-purchase display, there are other opportunities to reinforce your brand by snapping up secondary placement opportunities. By this we mean finding other places either around your permanent POP display or in other areas of the store to promote your brand. Make sure your secondary placement pieces are consistent with the brand image you want to create. Below are a couple examples of secondary placement vehicles that we produced for Descente and Hestra, both of which reinforced their premium image. 4. Keep the Big Picture in Mind- Your brand is more than a display. Where your brand is placed in a store can have an impact on your brand image. You don’t want to be that brand that is stuck in the dark back corner. It also is important that your display is serviced properly and kept clean. You can have the most beautiful display in the world, but if your products are in disarray or if your black base is covered in a layer of dust, it will reflect poorly on your brand. And, if you own a retail store, you certainly want to pay attention to this. We recently came across this infographic by Graphic House which offers some helpful tips about how to improve your business’s curb appeal. You can check out it here. 5. Ensure Your Branding Appears in Multiple Places on Your Custom POP Display- The attention span of consumers is so short these days that you have to hit them hard with your branding. Don’t settle for just having a header sign to promote your brand. Go the extra mile and add branding to various parts of your display to reinforce your brand name (without over doing it). The Adidas cap display shown below is a good example of tasteful branding. We started with a header logo and then added branding to the front and sides of the cap pockets and to the base area. 6. Go Where the Big Guys Aren’t- If you are a small brand, you might want to consider a strategy in which you don’t go head-to-head with the big guys. Instead, think about going where they are not. A good example of successfully executing this strategy is Ouhlala Gourmet. The company has a great line of squeezable fruit pouches, but they found it tough to compete with the bigger brands when they were placed side-by-side on grocery store shelves. Instead, they decided to go for stand-alone placement in the produce section of grocery stores. 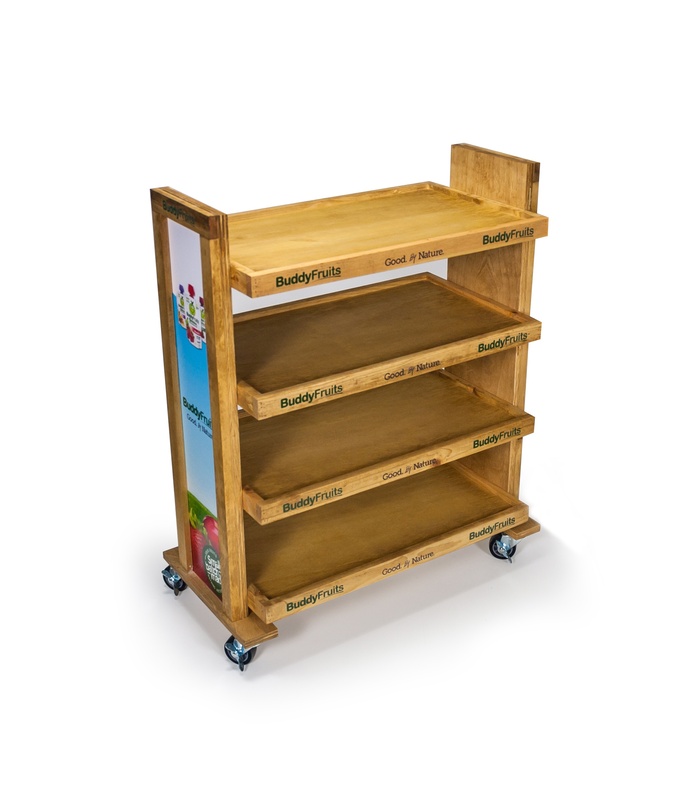 We created this low-profile shelf display which has helped promote their brand and drive impulse sales- all while setting themselves apart from their bigger competitive rivals.